MSU scientists have led the development of resources to help farmers in Africa and India protect their crops from fall armyworm, an invasive pest that has proven devastating since it was first officially reported in West Africa in 2016. East Lansing, MI (November 5, 2018) – Michigan State University scientists Barry Pittendrigh and Julia Bello-Bravo have led the development of resources to help farmers in Africa and India protect their crops from fall armyworm, an invasive pest that has proven devastating since it was first officially reported in West Africa in 2016. 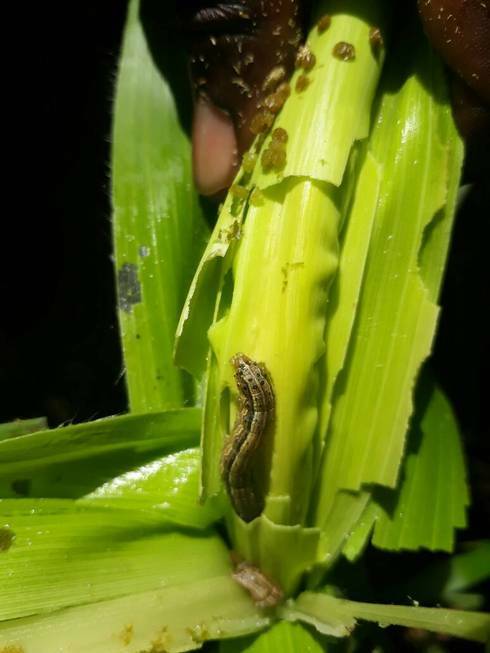 Native to tropical and subtropical regions of the Americas, fall armyworm larvae can potentially feed on a range of over 80 plant species, but the damage is mostly to valuable crops like maize, rice, cotton and sorghum. Since it was first reported in West Africa, the pest has spread rapidly to over 40 countries in sub-Saharan Africa, causing significant damage to crops like maize and sorghum. The invasive pest was more recently discovered in southern India, and there is an imminent threat of it spreading to neighboring countries in Asia. European customs inspectors have also reported finding and destroying the insect on quarantined crops coming from the Americas and Africa. Controlling the spread and mitigating the damage of fall armyworm has become a priority for international aid organizations. To help, the U.S. Agency for International Development(USAID) reached out to Pittendrigh and Bello-Bravo, founders of Scientific Animations Without Borders (SAWBO), to create video resources to help farmers identify and manage the pest. Through SAWBO, Pittendrigh and Bello-Bravo work with a global network of expert scientists and animators to produce animated videos, narrated in local languages, that deliver information to communities around the world on complex subjects ranging from agricultural pest management to the home finance. The animations are freely available to the public. To help farmers combat fall armyworm, Pittendrigh and Bello-Bravo collaborated with experts from USAID, the International Maize and Wheat Improvement Center (CIMMYT) and the Institute for Tropical Agriculture (IITA). The animation was completed in mid-August, with the SAWBO team now working to translate it into local languages. It will then be deployed by Pittendrigh and Bello-Bravo’s partner organizations in regions affected by the pest. The resources made available by SAWBO are invaluable to ongoing efforts to control the spread of fall armyworm. The animation is available on the SAWBO website, YouTube channel and mobile app. In collaboration with USAID, IITA and CIMMYT, Bello-Bravo and Pittendrigh have also recently published a paper in the journal Outlooks on Pest Management regarding the animation creation process and opportunities for others to use this content.